Yesterday my mother asked me about my experience of our traumatic end to our time in California in 1969 and our dismantled skulk back to Colorado. I told her we were so isolated by what we had been through. Think of it: we were in the midst of a circus in San Francisco in 1966-68 and Marin in 1969. I was fortunate to have a float in that parade, in getting to see and feel those many amazing instances of peace and love and beauty that could occur between total strangers, individually or in groups. As a very young child in the late 1960s, I also remember seeing and feeling neglect, physical abuse, drug abuse, hypersexuality, and so much incomprehensible human strangeness. Fortunately, I was a resilient and adaptable, easygoing little person and had a family who wanted to treat me as a person. My feisty littler sister was sensitive to issues of fairness and justice, and was a great mimic. 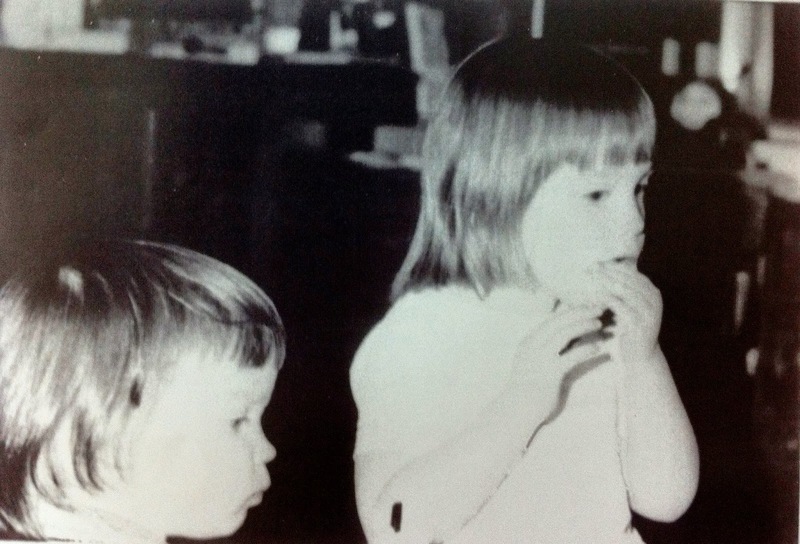 Then I lost my sister to a babysitter's carelessness (or lust, or participation in some moment that didn't involve watching my sister and her friend tricycling and running in circles around the swimming pool at the commune where we lived in Marin). When we moved back to Colorado, we were shattered. Apparently we didn't talk about what happened. I can't imagine what it must have been like for my parents to come to the door of my grandmother's house and have to tell her and then the rest of the family that one of our family was gone, erased, as if she'd never existed. As her bereaved sister, I could just be sad and sleep a lot, which I was and did. My parents carried a horrible burden of shame and regret, sorrow and rage, disappointment and disillusion. We could no longer say with that innocent certainty that things would all work out in the end. That was no longer possible. In a way we became a lot like the Vietnam vets who would return to the States having seen far more than they'd ever dreamed of, read about, or bargained for when they'd shipped out, green and innocent, having been nurtured by their families and friends right up until being thrust into that horrorshow of human experience and humanity/inhumanity. My mother tells me how we came to an acquaintance's family's house in Nederland, above Boulder, and told them our grievous tale. The wife burst into tears. "I can't believe you brought this to us," she said and ran from the room for the rest of the evening. (They ended up letting us stay in their tipi and use their kitchen and bathroom facilities for the next couple of months.) It seems to me that after that, we kept our hurt private. It was too heavy for anyone else to carry. It took years to get comfortable talking about Baby, but later we learned to reminisce about her: her precociousness at aping people's expressions, verbal and physical, and about her fearlessness compared with my caution. My mother said she felt she was often butting heads with Baby, and thought she had been our father's favorite child. Now, I know that some of the things that happened around me when I was small could easily have caused a social worker to whisk me away from my unstable environment and plop me into foster care. But it breaks my heart a little now to think that today, if a child lost her sister -- and a family lost a child -- to a tragic accident, that child and family would all be plied with grief counseling services and offered help to process what had happened and move forward. But no. We didn't have a funeral for my sister. Some of the mysteries of human experience remained associated with San Francisco forever, and I think as soon as we left I was always trying to find ways to get back there, to where I had last seen and played with my sister. Things shifted when I started to realize that there were resources to help me, such as music, to lift my spirits and soul; the library, full of books where I could learn about other ways of doing, living, and being; and movies that showed me up close things that people around me didn't talk about. I had friends, people who listened when I talked, and who wanted to help me. One of our friends from the Olompali commune days, Vivian Gotters, reconnected with us when I was a teenager, and she was my wise pen pal through some rocky moments. I had counselors at school who helped me talk about the bouts of alcohol and rage my father cycled through, gave me reality checks that the injustices I suffered were indeed not normal, nor right; and helped me keep my head up (and down) at the same time. I kept seeking ways to speak my truth. As a student of self-defense I went on to learn more about the boundary between me and everyone else and found ways to say no that I had never comprehended were possible for me. I think everything I have worked at in my life has been about opening channels of communication so that information can flow freely. It was isolating and stifling to be told, “We can handle our problems inside our own family.” That wasn't true. My father mishandled our feelings and drank his own into oblivion. I did appreciate my mother saying to me, “If you can't talk to us, you know a lot of people who love and care about you whom you can talk to.” I took full advantage of that (some might say too much – I think I could be kind of a leech when I really liked someone). I would not be who I am today without the strength of my desire to keep information and love, energy, compassion, and curiosity flowing better and more freely everywhere I turn. I am grateful for feeling connected, not isolated, and for my many open channels of communication. They have truly saved me from many fates far worse than this.